Discounts: The Autry is included in the Go Los Angeles Card. The Entertainment Book includes a 2 for 1 discount. You may also occasionally find discounted Autry tickets on sites like Groupon, Living Social and Goldstar. Free Days: Free to the public on the second Tuesday of every month, New Year's Day, Martin Luther King, Jr. Day, and Presidents' Day. Whether you're a fan of cowboys and Indians as you've seen them in the movies or as you've learned about them in real life, The Autry has the best collection around of artifacts of the real West and the celluloid West. The Autry National Center includes the Autry Museum at Griffith Park, the Southwest Museum at Mt. Washington and the Autry Institute, which includes the Autry Research Library and the Braun Research Library. The Autry's extensive collections focus on Native American cultures and the history of the American West, including the depiction of both in art, movies, television and popular culture. The Autry in Griffith Park was originally know as the Gene Autry Museum of Western Heritage. It was founded by Gene and Jackie Autry and Monte and Joanne Hale to interpret the American West and its influence in America and the world. Given Gene Autry's role as cowboy singer and actor, it's not surprising that a significant amount of museum space is given to the portrayal of the American West in TV and movies, and the lives and contributions of famous cowboy (and cowgirl and Indian) actors and singers. Permanent exhibits include Art of the West, a Cowboy Gallery that interprets the cowboy experience in the West from the early open range era through modern times; Four Centuries of Pueblo Pottery; the Imagination Gallery, that highlights the Hollywood West; the Community Gallery which compares how eight different ethnic communities lived in the Old West, a Family Discovery Gallery, and more. The Autry in Griffith Park also has one of my favorite museum gift shops and the Crossroads West Café. The Autry hosts a number of annual festival and events including the Cowboy Festival in July, the American Arts Marketplace in November and the Sizzling Summer Nights Summer Concert Series. 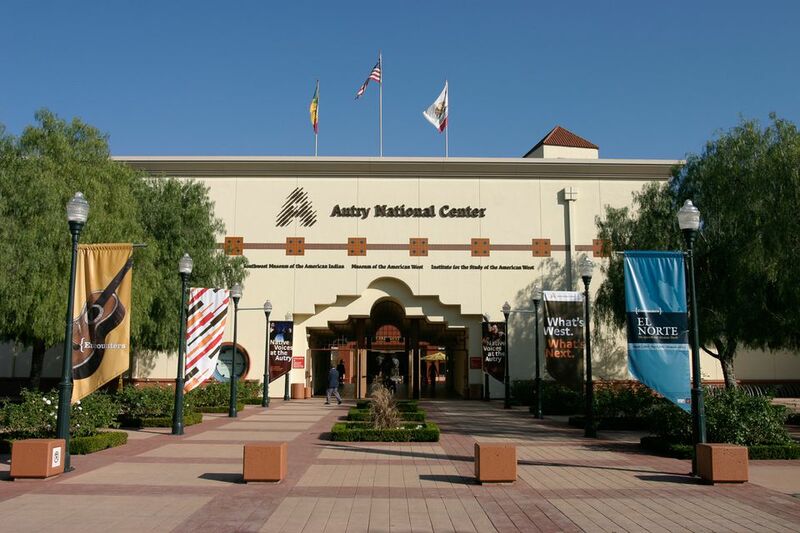 The Autry is located directly across from the entrance to the LA Zoo and can be accessed from Zoo Drive off the I5 Freeway and Riverside Drive from SR 134 (Ventura Freeway). The Southwest Museum Mount Washington Campus is the oldest museum in Los Angeles. It is the original location of the Southwest Museum of the American Indian, which opened in 1907. A significant portion of the Southwest Museum Collection is now on display at The Autry in Griffith Park. Most of the Southwest Museum is now closed to the public and used for conservation efforts, but there are a few galleries open on Saturdays only. Take the photo tour on the next pages to see a sample of what you'll find at the Autry in Griffith Park. A bronze statue of Gene Autry graces the courtyard at the Autry in Griffith Park. In the Gene Autry exhibit at The Autry Museum, you'll learn that in addition to having five stars on the Hollywood Walk of Fame for radio, records, film, television and live theatrical performance, Gene Autry was owner of the Angels baseball team. The Spirit of Imagination takes you onto a Hollywood Old West set complete with false facades. In the Spirit of Imagination Exhibit, you can mount a fake pony to test out the green/blue screen effect that drops a background in behind you. Pick up the Autry Scavenger Hunt booklet at the Information Desk to answer trivia questions as you go through the museum. The Autry exhibits a variety of clothing and artifacts from the Old West from various social classes and ethnic groups. The accoutrements of a soldier's life in the Old West on exhibit at The Autry in Griffith Park. Michael Jackson had his favorite costume designer create several costumes inspired by a particular pair of cowboy boots. Two costumes and some shiny boots are on exhibit at The Autry. Mother and daughter in cowboy hats learn about American Bison AKA buffalo at The Autry in Griffith Park. In addition to Sizzling Summer Nights Concerts, The Autry hosts a variety of live music events throughout the year. Check the Calendar for upcoming events. Cowboys demonstrate lasso techniques to children at the Cowboy Festival at The Autry in Griffith Park.